I see into the future and I see a new pattern release coming soon! Yes, I think early next week, I will have another pattern for you. I also have a shawlette going up for test knitting next week! Wooo! I had a bit of a dilemma with the blog this week. I can’t really show you any of my WIPs and I don’t have a new finished object that I can show you either! I will definitely have a FO for you next week though! I promise. What can I show you? I can show you something silly. I decided yesterday that I really needed to clean off my desk. All of the yarn I had on it was just too much to deal with! I was afraid they would start sprouting baby skeins and then I’d really be in trouble(or in heaven, madtosh baby skeins, yes please!!) 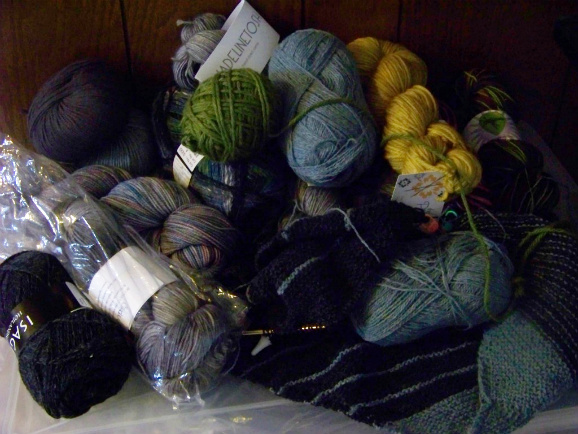 But, yes ALL of this yarn has now been moved to another, more secure location. Of course, I got two skeins of yarn in the mail today so…it starts again. sigh. The princess phone skein is in this picture! Can you find it? There is also a WIP in this picture. So, technically there is a WIP picture this week. I have an in progress Stripe Study. I have no idea when this will get finished. I haven’t worked on it at all this week! To close out this mish mash post. I have been thinking about doing another KAL. Though, this one would be a bit different than my Momo KAL. 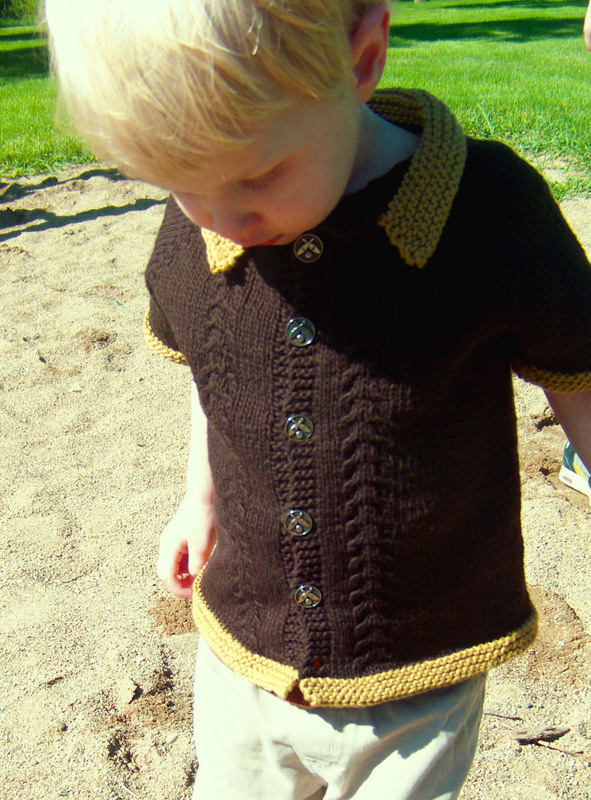 I am thinking of doing a baby/toddler/kid KAL in my group. I have lots of kids patterns and I thought it might be fun. Could do a giveaway or two or something. I am thinking about September for this. So, let me know what you think! Yes, as some of you know, I am a fan of the movie, The Big Lebowski. Well, I took that inspiration and I rolled with it this time… ha, get it, rolled with it. Yes, I know that was bad. But, bad puns aside, I released a new pattern this week which draws its inspiration from the ten pin activity and of course from the movie. When I was growing up, I bowled a lot. No, seriously, a lot. I lived in a small town and the one thing that small town had, was a bowling alley. There was very little to do aside from hanging out at the bowling alley (or the library, wait, was that just me?). Ok, so onto the design. 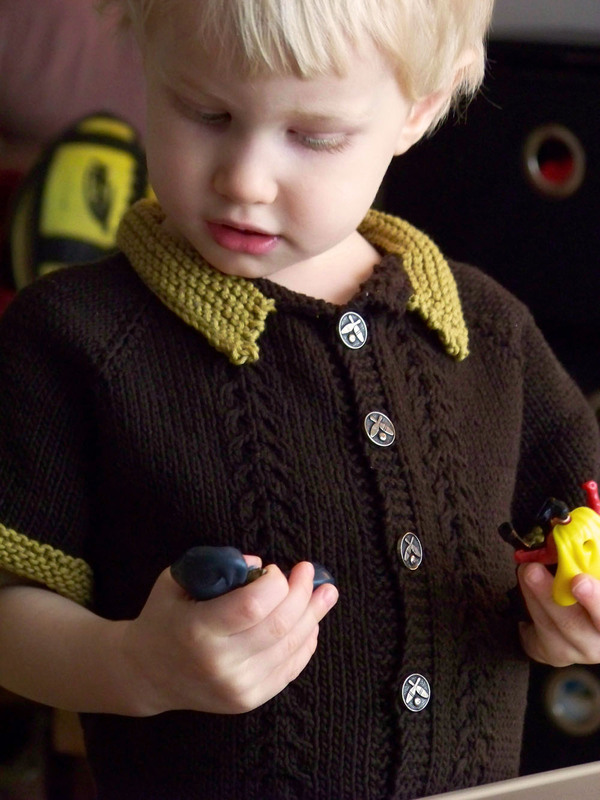 It’s a unisex top for the little one adorned with cables running down on each side of the button front. The sample is knit up in Blue Sky Alpacas Skinny Dyed Cotton. The main color is coffee and the contrast is Maize. I really love the fabric that this yarn makes. It’s so dense and soft and just wonderful. 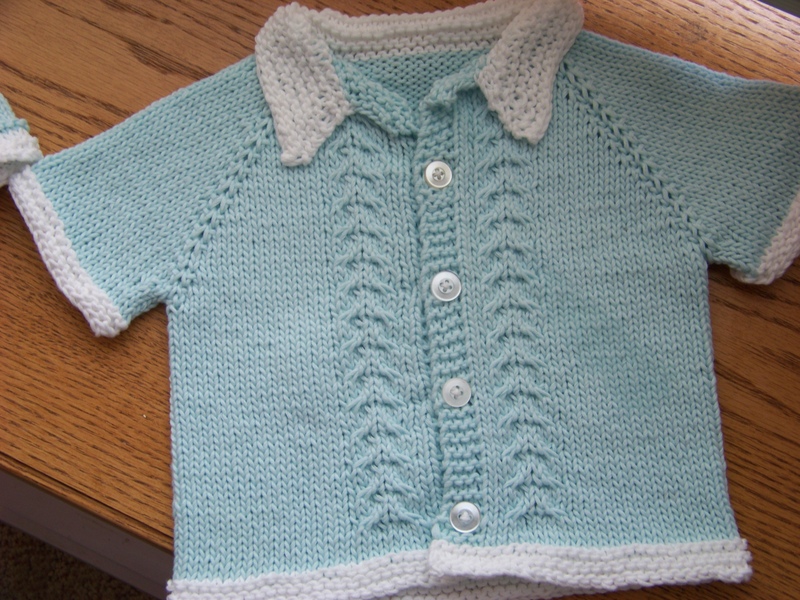 I think it knits up a lovely children’s garment. This does knit up equally as nice in other fibers. One of my testers used bamboo and another used superwash wool. They are both quite lovely. I enjoyed knitting this so much that I knit another out of leftovers from another upcoming design done in the same yarn. You can really see the details here. The cable is a 7 stitch cable with 4 rows. Easy to remember. 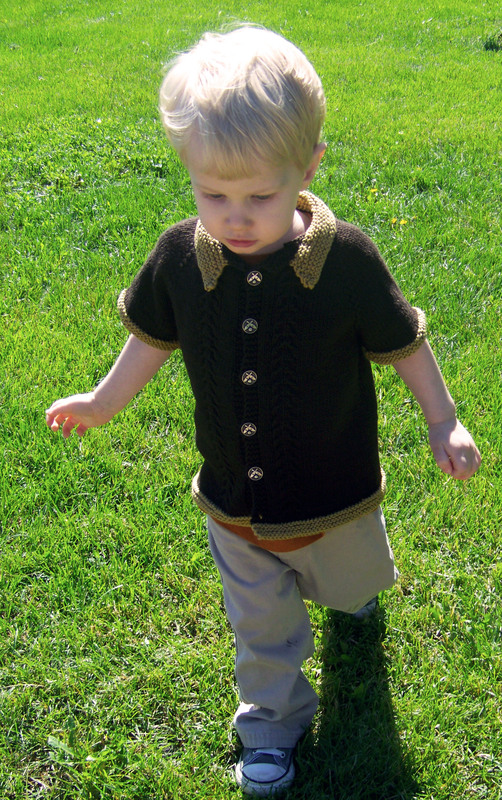 The edging and buttonholes are worked with the main body of the shirt. The collar has a couple of short rows so that it will lay down nicely. This picture is just to illustrate how difficult it is to photograph a 2 year old. He doesn’t do a lot of standing still. Hello there dear public. This week went by so fast and yet so slow at the same time. I kept thinking yesterday was Wednesday. The whole day! Like many places across the United States, the weather here has been unbearably hot! Cooped up inside all week pretty much did me in. I decided to take one day a week to show either a WIP(work in progress) or FO (finished object) in order to get myself posting more. Some people’s blogs seem so organic. They have a certain flow to them. I feel sometimes, like I am forcing it. So, I thought maybe if I just do it more, it will get easier. Like writing patterns. It seemed so daunting, at first. Now, it doesn’t seem difficult at all. It’s sort of cathartic. 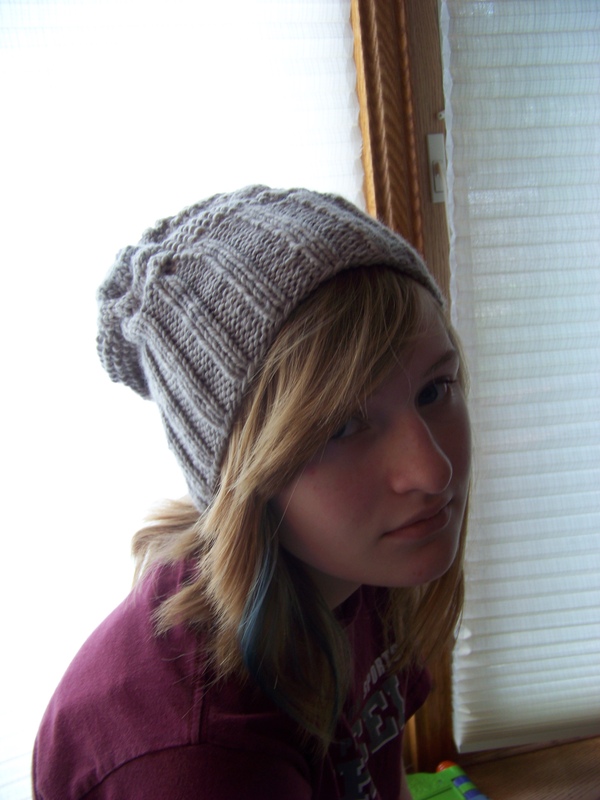 My FO this week is a cute little hat, The Bergen Street Tuque. This is a pattern by Caryl Pierre of Caryl Style . 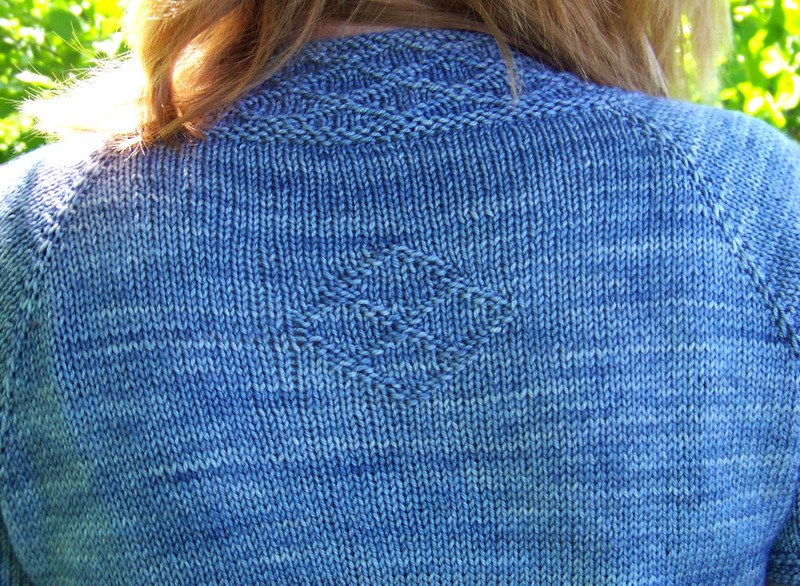 This is knit up in the GORGEOUS Plucky Knitter MCN Aran in the colorway Steel Cut Oats. Have I mentioned that I have a thing for gray. Well, I have a thing for gray. It’s modeled here by my lovely daughter. She’s practicing her “moody teen” look. She’s so silly. Make no mistake about it though. This is MY hat. It is gorgeous and it’s all mine! This was just what I needed. 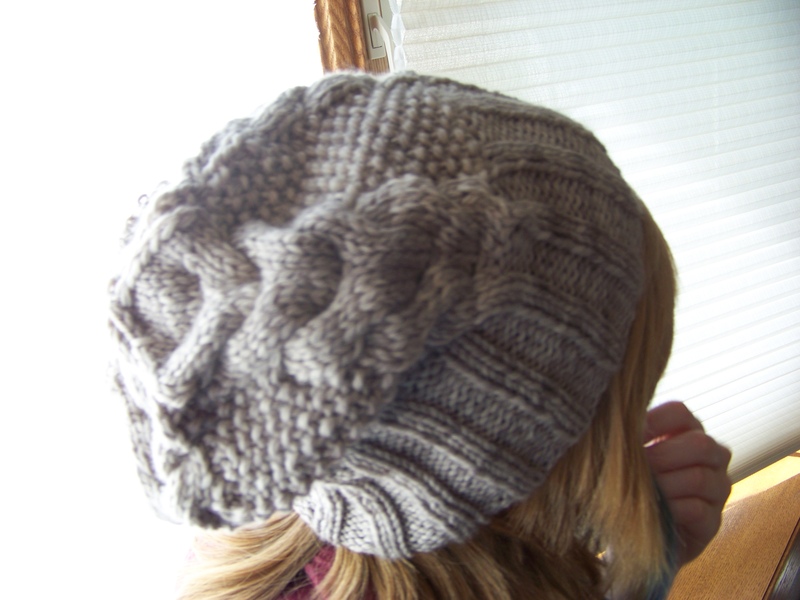 The combination of a great pattern and great yarn! That’s all for this week. Make sure you stop by early next week, I’m releasing a pattern! I’ve been trying to get this blog post done all week! I keep getting interrupted. I guess that’s how it goes when the kids are home for the summer! At any rate, I want to show you all my latest pattern release. I am extremely happy with this one. 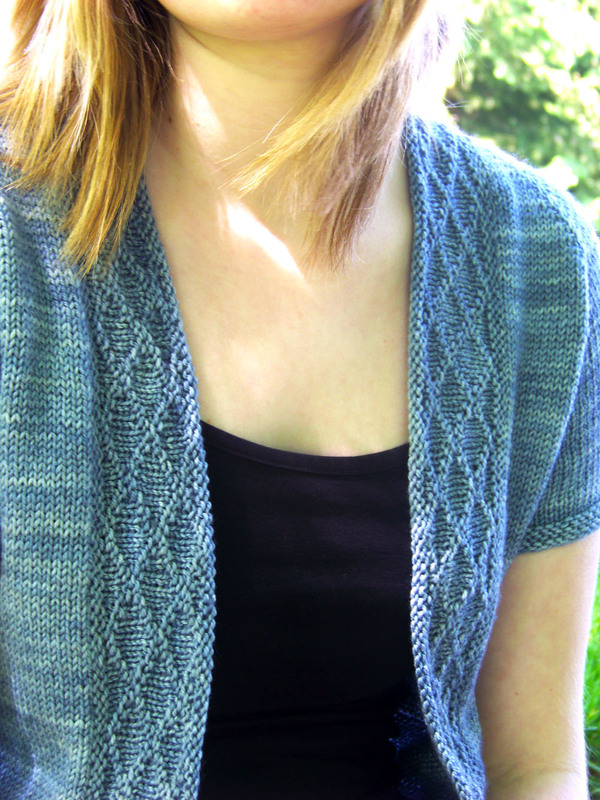 Rhombi is a top down open front cardigan. Now, you have noticed. I have a thing for the diamond shape. So, I chose another diamond motif for this pattern and that is where the name comes from, the rhombus. Since there are multiples. I called it Rhombi. Rhombi is knit up in the amazing Squoosh Fiberarts Rapture . This yarn is so wonderful to knit with. It is a Merino Superwash Silk Cashmere that just flows beautifully. 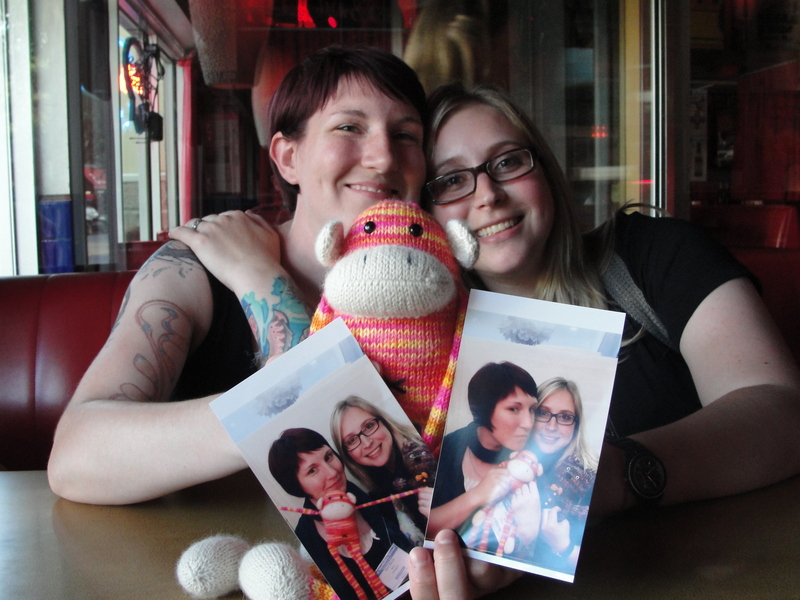 It was a pleasure to knit with. I really cannot say enough good things about it. Knits beautifully, blocks beautifully and the color is just so amazing. I used the colorway Air for this pattern. I can definitely recommend this yarn. 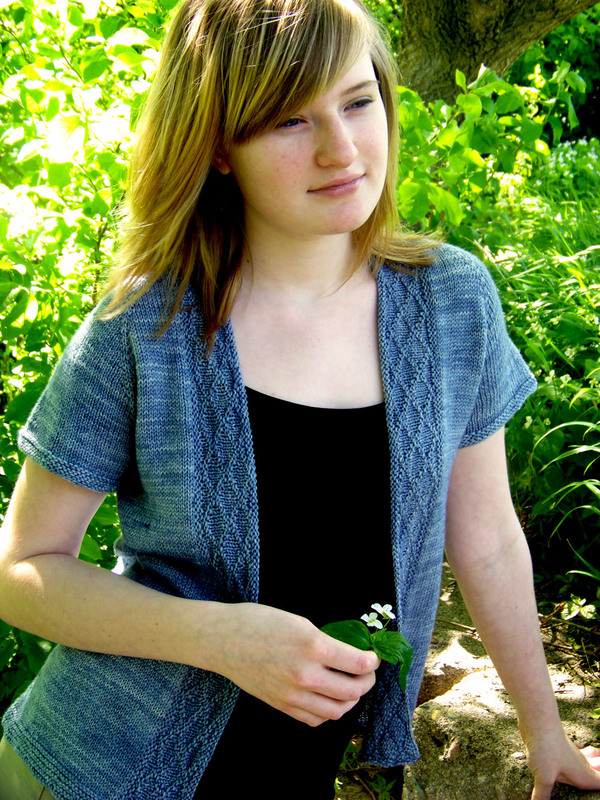 Please stop by Squoosh Fiberarts shop and check out the absolutely incredibly yarns! As you can see the main detail on this sweater is on the collar/neckband. The body of the sweater is stockinette. The collar is picked up all around and knit. There are no cables, those are knits and purls. But, it looks very striking in person. I tried to capture it in the photos as best I could. Also in the picture, you can see, it is an open front cardigan. I really like the open front. There is an optional diamond detail for the back, placed between the shoulders comprised of knits and purls. It’s a fun little element that helps break up the stockinette a bit. There are directions for two sleeve lengths, as well. I’ve also included instructions for elbow length sleeves. Well, I hope you all like Rhombi as much as I do. If you would like to purchase the pattern, you can do so here. Please stop back soon. I am thinking of a weekly feature in addition to pattern releases, but I just haven’t decided what to focus on yet. On top of that I have a lot of stuff in the works! I have two new baby patterns coming VERY soon and I am working on so many other things too! Some of them are secret, so I can’t be too descriptive quite yet. This and that…and Thank You so much! Hello! I can’t believe how awesome this last week has been. Since Kindling has been published, I have gotten a lot of fantastic feedback from the knitting community. Thanks so much for all of your wonderful comments and all the love you have given my pattern. It’s current “heart” count on Ravelry is 599! Now, I want to introduce you to a new yarn company. Meet, The Wool Dispensary! The Wool Dispensary was founded in 2011, by a dyer, Sam Boce, and designer Bree Miller. 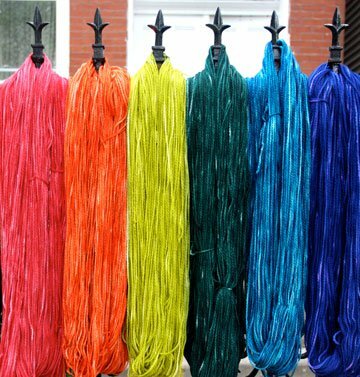 They dye special and limited kettle dyed yarns sourced from small farms across the United States. Along with that they offer complimentary patterns. You can read more in depth about the pair here: http://thewooldispensary.com/ . They are currently working on getting themselves to YarnCon. 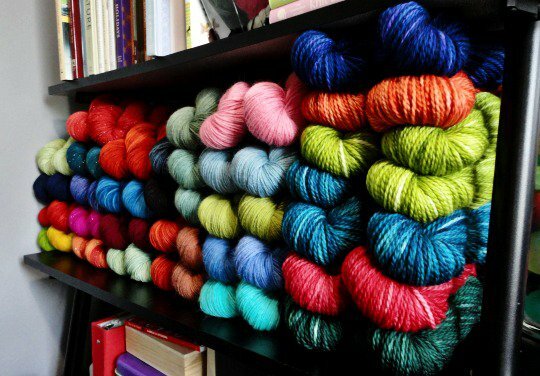 YarnCon is Chicago’s own yarn exhibition. To help cover the costs of this endeavor, the pair have “kicked off” their very own Kickstarter campaign. A Kickstarter campaign is a way for creative minded people to raise money. Really, the FAQ explains this way better than I ever could. I love Kickstarter campaigns. I think they are a great way to help out creative minded people accomplish what they want to accomplish whether it be publishing a book or starting a yarn company! Being creative minded myself, I believe that there is never enough support for art-related projects. So, things like Kickstarter, are really just fantastic. And really we knitters benefit from there being new wonderful yarns on the market, right? Check out The Wool Dispensary’s Kickstarter campaign here! Seriously, just look at those colors. So, yes please, check them out. I hear their shop is supposed to be going up soon. Hopefully, I will be blessed with a payday immediately beforehand because, they have some colors that have stolen my heart.